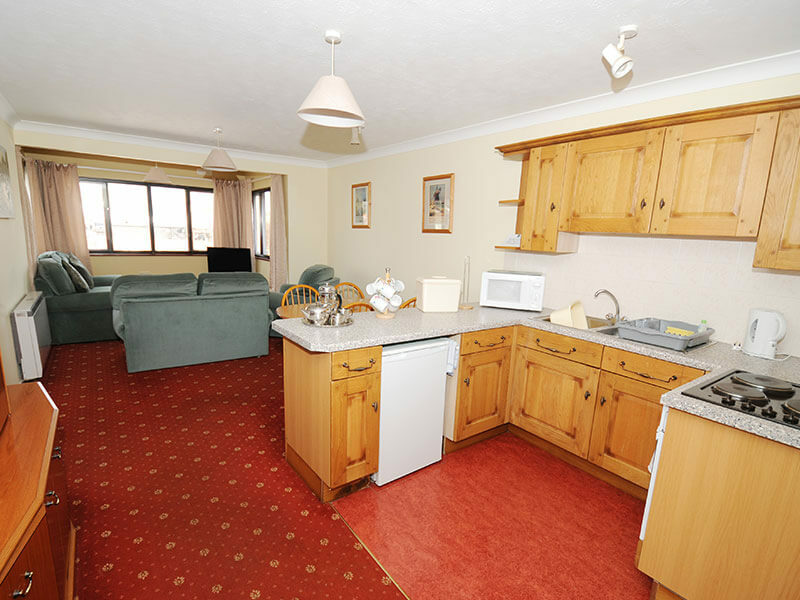 Open plan sitting/dining room /kitchen with electric hob, oven and microwave, TV and DVD player. 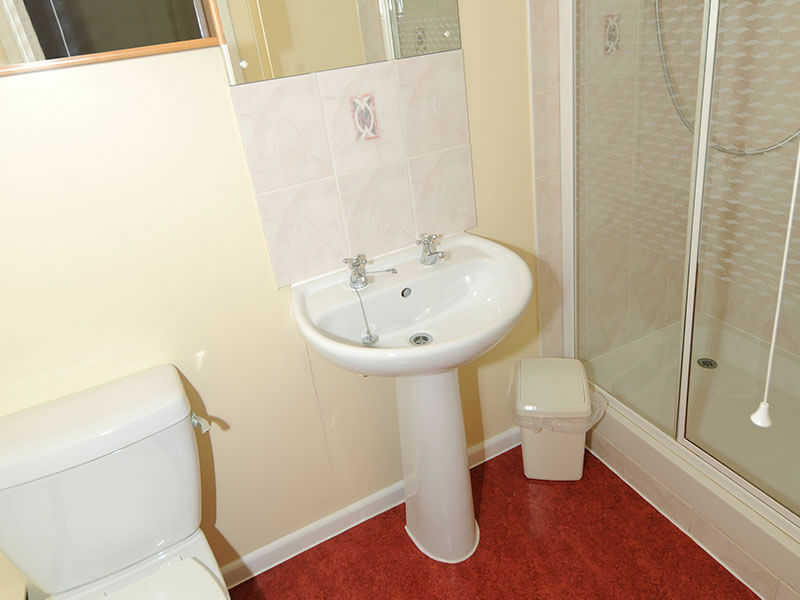 One double bedroom and one twin bedroom both with en-suite shower, wc and handbasin. Storage heaters. 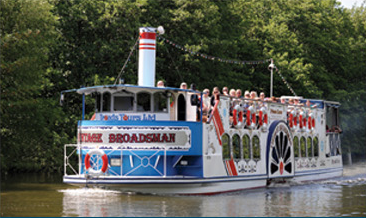 Our sister company Broads Tours offers a variety of river trips throughout the main season. 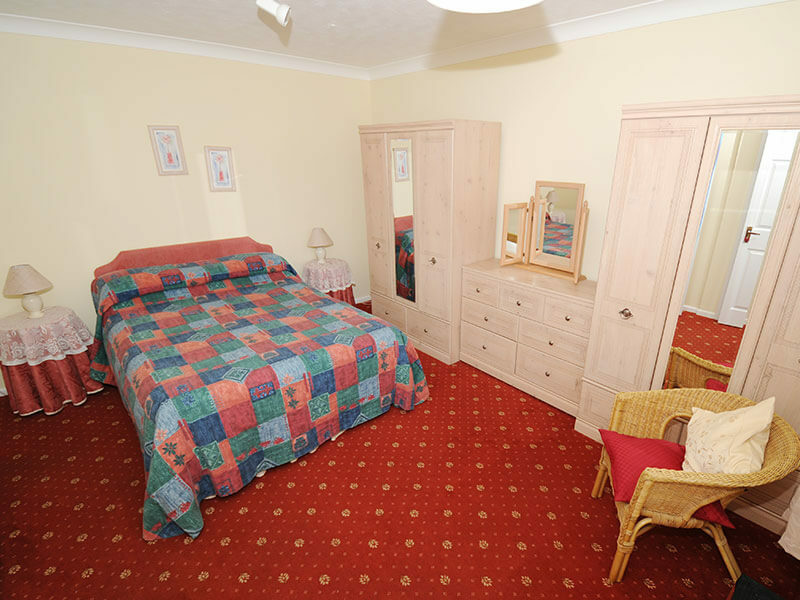 A 25% discount is available to our holiday cottage customers on the daily tours. At all other times of the year you will receive a discount of 25% off the hire terms on any of our day boats and day cruisers. 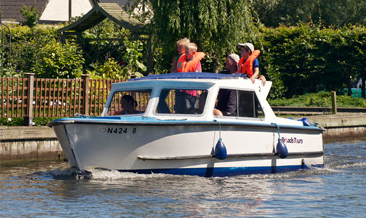 **A 25% discount is available to our holiday cottage customers on Broads Tours River Trips. (Please note discounts are not available on special or themed tours). River trips are available between 1st April – 31st October. For further details about these offers and full terms and conditions please ask a member of our reception team on 01603 782207. The first step to your holiday on the Norfolk Broads is to select the right type of cruiser or holiday home to suit you and your parties requirements. You can do this either online, by using our brochure or you can telephone us on 01603 782207 and speak to a member of our booking team who will be happy to help you make the right choice. Check if your chosen holiday is available for your preferred dates. You can either check availability online or by enquiring directly with us via email or by telephone on 01603 782207. Boating holidays can start on either a Monday, Tuesday, Friday or Saturday and holiday home breaks can start on either Tuesdays or Saturdays. 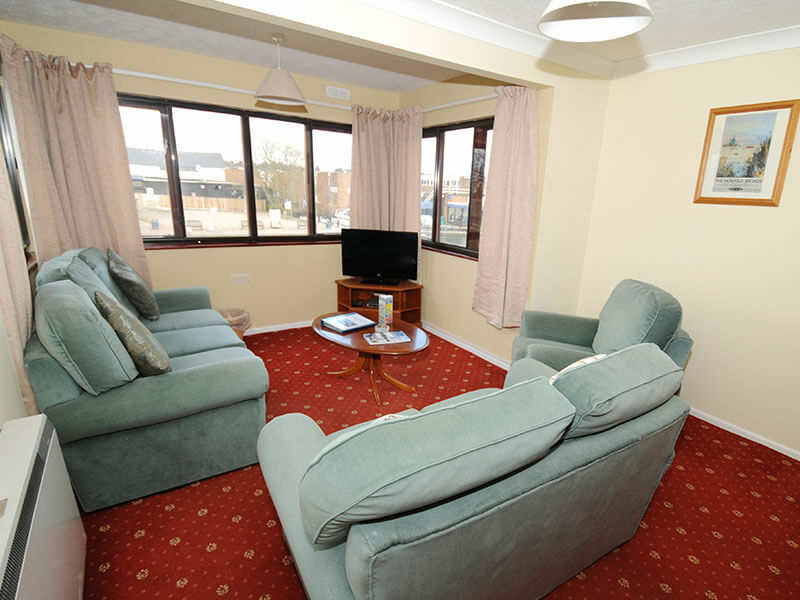 Bookings can be made online or over the telephone. If you prefer to book online select the Book Now option and you will be taken through a short process to secure your holiday. Alternatively to book by telephone, call us on 01603 782207 and one of our reception team will be delighted to book your Norfolk Broads holiday for you. can be paid for by debit or credit card (We do not accept American Express or Diners Club cards). The full balance then becomes due 70 days before your holiday start date. Please be aware that at certain times we will offer the opportunity to pay a low, non-refundable deposit of £25 per week as an early booking incentive. The balance of the deposit, see above, will then be due on or before the 1st February of the year of travel. Please note that the balance of hire terms, damage waiver / security deposit and fuel deposit should be paid 70 days in advance of your holiday start date unless otherwise stated on the booking confirmation. Receipts are issued to all customers. Please Note: Due to changes in financial regulations we are no longer able to offer personal insurance cover. Read more about our Payment Terms and Conditions in the tab above. If you have already visited the Broads, Britain’s magical waterland, we know that you will want to return again and again! We always love welcoming you back to the Broads and Norfolk Broads Direct. We are therefore delighted to operate a Returning Customer Loyalty Scheme. Every time that you take a holiday with us you will receive a Unique Voucher Code entitling you a 5% discount off the hire terms of your next holiday (see T’s & C’s below). Please remember to have your loyalty voucher to hand when booking your next Norfolk Broads Direct boating or cottage holiday. 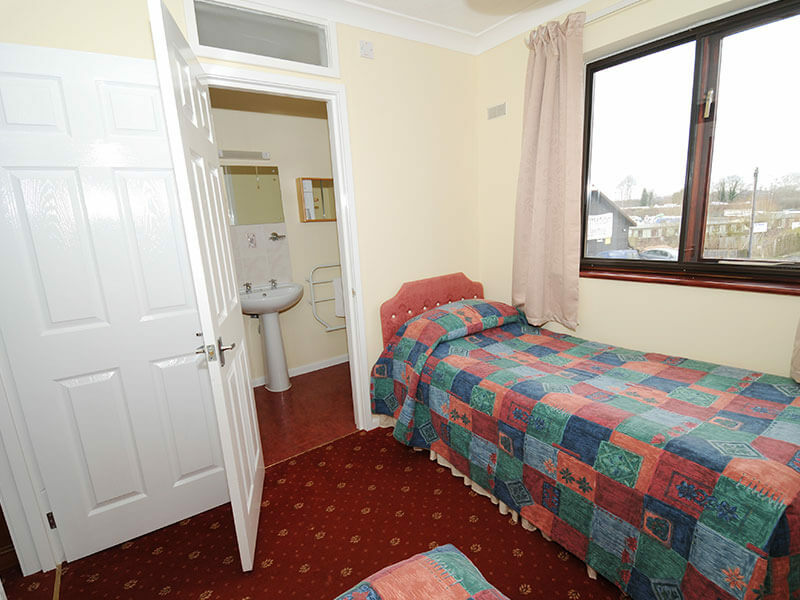 Bookings can be made either online or by telephone on 01603 782207. Here at Norfolk Broads Direct our policy of continuous development and investment in our Faircraft Loynes Fleet and our waterside holiday homes gives you the assurance that you can holiday with us again and again in complete confidence. There really is no better seal of approval than to see the happy faces of returning customers year after year! Our team of friendly reception staff are here waiting to answer any questions that you may have about your next Norfolk Broads Direct holiday, please call us on 01603 782207. We are looking forward to welcoming you back to the Norfolk Broads! Your contract is with Norfolk Broads Direct Ltd (referred to throughout these terms & conditions as “NBD”). Any contract to hire a boat listed on this website incorporates the conditions below and is between NBD and you as the hirer. The contract does not take effect until NBD despatch written confirmation of your booking to you. The contract is made in England and is governed in all aspects by English Law. All Correspondence will be sent to the address on the booking form . NBD may refuse to accept a booking at its discretion and will not accept any booking form signed by a person less than 18 years old. You must send the initial payment with your booking form / with your online booking. This payment comprises your booking deposit in part payment for the cost of your boat or property and your Cancellation Protection payment (mandatory). It will be refunded if your booking is not confirmed. The balance of the holiday price must be received by NBD no later than 70 days before the holiday start date. If booking within 70 days, full payment must be made when booking. If booking within 14 days of the start date, full payment must be made by debit or credit card. It is not normal practice to send reminders and if final payment is not received as required, NBD may cancel the booking and apply charges (see para 9). Travel documents will not be released until full payment has been received by NBD. Post dated cheques will not be accepted and NBD may recover the cost of any bank charges or other costs incurred in handling dishonoured cheques, direct bank payments and foreign currencies. (b) if you cancel your booking (see para 9), you will be required to pay the balance of the deposit which would normally have been payable in the absence of any promotion. (c) If the holiday is cancelled to low deposit will not be refunded. NBD guarantees that there will be no surcharges within 70 days of your departure but reserves the right to alter the price of any of its holidays before you make your booking. All hire terms are inclusive of VAT and quoted in £ sterling per boat/property per holiday, equipped as described unless otherwise stated. As soon as the booking is confirmed by NBD the hire terms are guaranteed unless there is a change in the rate of VAT. Insurance against cancellation or curtailment of your holiday is mandatory – this payment is included in the brochure price. We also recommend that you have adequate personal insurance cover for your holiday needs. As we are no longer able to offer this service you will need to make independent provision. NBD are not responsible for the loss or damage of any of your personnel effects or your vehicle whilst it is parked on our site. If you wish to change your booking after NBD has issued your confirmation, NBD will do its best to help but has no obligation to make any change other than to allow you or any member of your party to transfer the booking to another party or parties, provided that written notice is received from the person who signed the booking form. Transfer from one boat to another within this brochure will be possible. If NBD are able to make changes, an administration fee of £35 may be charged. Please note that major changes may be treated by NBD as a cancellation by you and will be subject to charges referred to in para 9. Any change you wish to make to your holiday once it has commenced is your sole responsibility. 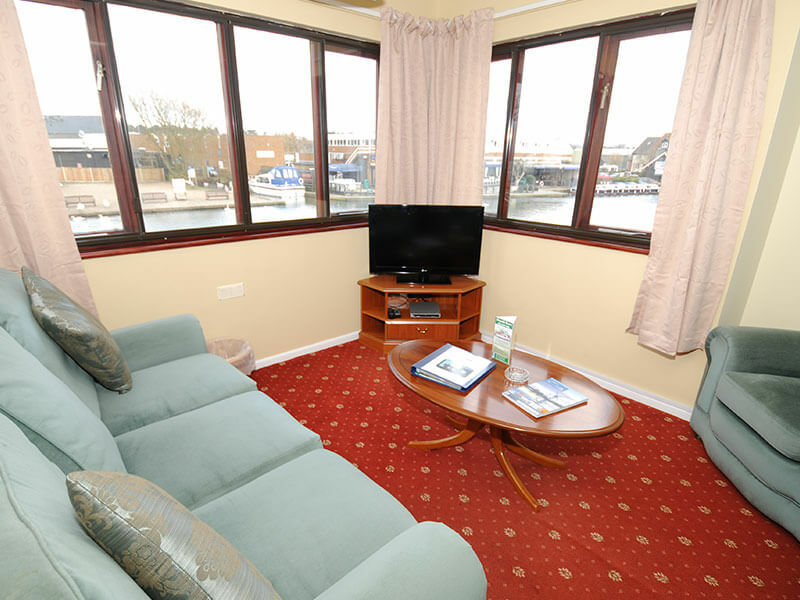 If you are forced to cancel your booking you must notify NBD immediately by telephone and send written confirmation (signed by the person who signed the booking form) by Recorded Delivery to the Wroxham boatyard address, enclosing your booking confirmation. The cancellation will be effective from the date written confirmation is received by NBD. If the reason for cancellation is within the terms of the NBD cancellation protection, (see below) you will receive a refund of monies paid less a cancellation administration fee of £35. If the reason for cancellation falls outside its terms, NBD will make a charge as below. (b) cancellation less than 70 days before start date (or if NBD cancels because you fail to pay the balance of the holiday price as required by para 3) – you will be liable to pay the whole balance less any hire charges NBD may be able to recover by reletting the boat. If you have received your Norfolk Broads Direct Travel documents, no refund (if due) will be made until these are received back by NBD. It is not possible to make refunds for any services booked but not used. Death, illness, bodily injury, pregnancy or childbirth providing pregnancy commences after the insurance is effected. Jury service, witness call. Redundancy, as long as the employment has been continuous with the same employer for at least two years. Cancellation of arranged leave in respect of a member of HM Forces or police. Unexpected occupational postings within six weeks of the commencement date of the holiday or involving an occupational transfer in excess of 50 miles. Fire, storm, flood, subsidence or malicious damage rendering the home uninhabitable. Police requiring presence following a burglary or other incident at home or place of business. Death, serious injury or serious illness of any member of your immediate family, fiancé(e), close business associate, partner or co director. Please note all of the above reasons must not have been within your knowledge at the time of booking. (a) accept the alteration and the contract will be varied accordingly. (c) cancel and receive a refund of money you have paid. (b) a full refund of any monies you have paid. NBD may at its absolute discretion refuse to hand over a boat or terminate a holiday where in the opinion of NBD a person or group is likely to cause damage, distress or annoyance to other persons or property. In such event NBD will be under no obligation to refund, compensate, or indemnify you. Compensation for children invoiced at reduced prices will be paid on a pro rata basis. No further claims for compensation or expenses will be considered. (a) Unusual or unforeseeable circumstances beyond NBD’s control such as war, threat of war, riot, civil strife, industrial dispute, terrorist activity, natural or nuclear disaster, fire or adverse weather conditions including flooding of waterways. (b) Your failure to pay the balance of the holiday price within the time stipulated. (c) As a result of your behaviours as set out in para 9 above. (c) NBD will give you a demonstration and explain the controls of the boat and its equipment. You must notify NBD of any faults in the equipment of the boat identified either before or after the boat leaves the boatyard so that they can be rectified. Any issues with the cleanliness of either a boat or property this must be mentioned before starting your holiday. (e) unless otherwise stated you must return the boat (with all gear and equipment) to the boatyard in a clean and tidy condition by 9am on the final day of hire. A charge will be made if the boat is returned late or is not clean and tidy with all rubbish being removed before leaving the boatyard. (c) report the full details in writing to NBD on return from holiday quoting your booking reference number. No repairs may be put in hand without NBD’s consent. On returning the boat at the end of your holiday you must inform NBD of any damage or items broken, lost or stolen. Although boats are insured by NBD you are primarily responsible for any damage to the boat, its equipment or to any third party property and for loss of equipment. NBD will require either a (i) Damage waiver payment with separate fuel deposit. The damage waiver is non-refundable. You are indemnified for any damage to the boat, its equipment or to any third party property and for loss of equipment; or (ii) Security deposit with separate fuel deposit. Fuel costs exceeding the fuel deposit will be charged to you. For information including the normal charges see individual boats. Additional deposits. NBD reserves the right to charge a security deposit on certain parties – you will be advised when you book. If you return the boat without damage, loss of equipment or third-party claim against you, the deposit will be repaid. Where damage has occurred, all or part of your security deposit may be withheld by NBD. Not withstanding the above if you or any member of your party either fail to comply with booking conditions or cause negligent, wilful or criminal damage you will be fully liable for any loss incurred. Every boat is checked before the start of each hire and in the event of a mechanical failure the right is reserved to delay departure until a repair has been effected, so it is unlikely that your boat will suffer a mechanical breakdown. If a breakdown of any kind occurs, you must report it to NBD immediately so that repairs can be made to enable you to resume your cruise. Provided that NBD is so informed, they will take steps to repair the boat and/or its equipment as speedily as practicable in the circumstances. Apart from these obligations, NBD shall not be liable in any respect for any indirect or consequential loss or damage, whether financial or otherwise, suffered as a result of such a breakdown. NBD shall not be responsible for the consequences of delays or restrictions on cruising arising from obstruction, repairs or damage to waterways, flooding, shortage of water, industrial action or other circumstances beyond their control. The right is reserved to restrict cruising if unusual or hazardous conditions prevail. You are responsible for any charges made by waterways authorities in respect of loss of water or damage to waterway property caused by you while in charge of the boat. (c) permit your boat to be taken out to sea; or You must navigate in accordance with current bye-laws and must observe the speed limits applicable to the waterway. No hire boats may be taken below Haven Bridge, Great Yarmouth or through the lock at Oulton Broad. More detailed information will be provided at the boat yard. You may not take on the boat, without NBD’s prior permission, portable heaters of any type, lighting equipment or anything which may cause danger to the boat, its equipment or its occupants. NBD is not liable for death, personal injury, or loss or damage to you or your property, or any property belonging to or in the possession of the hirer or any member of the hirer’s party (including any motor cars or their contents parked at the boat yard) unless it is caused by NBD’s negligence or wilful default. 22. Party Members with limited mobility. If you have any members of your party with limited mobility, you must enquire as to the suitability of the boat at the time of booking. Whilst no guarantee can be given, NBD will offer assistance and advice so far as is practical. The number of persons indicated for each boat must not be exceeded except where provision for extra persons is specified in individual boat particulars. Optional extras such as dinghies, etc. may be available at extra charge as stated in the brochure, but are subject to availability on your hire start date. Up to two pets are normally allowed onboard a boat unless otherwise stated in the boat details, at an extra charge. If you wish to take more than one pet, you must obtain prior permission. Every effort has been made to ensure that individual boat descriptions contained in the brochure are correct. However, the right is reserved to make modifications to boat specifications that are considered necessary in the light of operating requirements. Layout plans in the brochure are for general guidance and are not to scale. Illustrations and photographs of standard production built boats are sometimes used and the interior and exterior colour scheme and layout of your boat may therefore not be identical with the one in the brochure. Any dispute, difference or question which may at any time arise out of the contract or the subject-matter thereof shall be referred to a single arbitrator to be agreed upon between the parties (or failing agreement to be nominated by the Chartered Institute of Arbitrators on the application of either party) in accordance with the provisions of the Arbitration Act, 1950, or any statutory modifications or re-enactment thereof for the time being in force. These conditions supersede all previous issues. 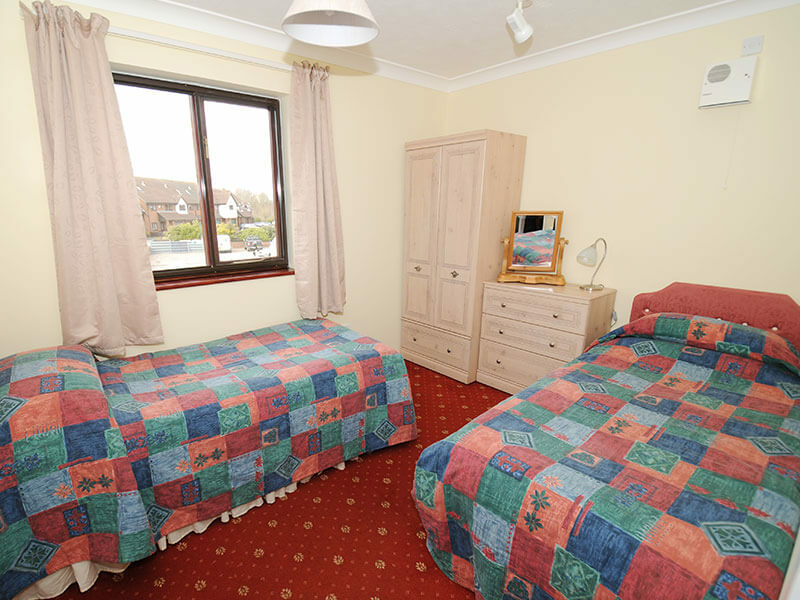 Lovely cottages immaculately cleaned before occupation. Very comfortable too.